We discussed all things mountain biking and I’ve signed on to be the club’s new mountain biking ride coordinator—hence, the staged photo in my front yard yesterday. 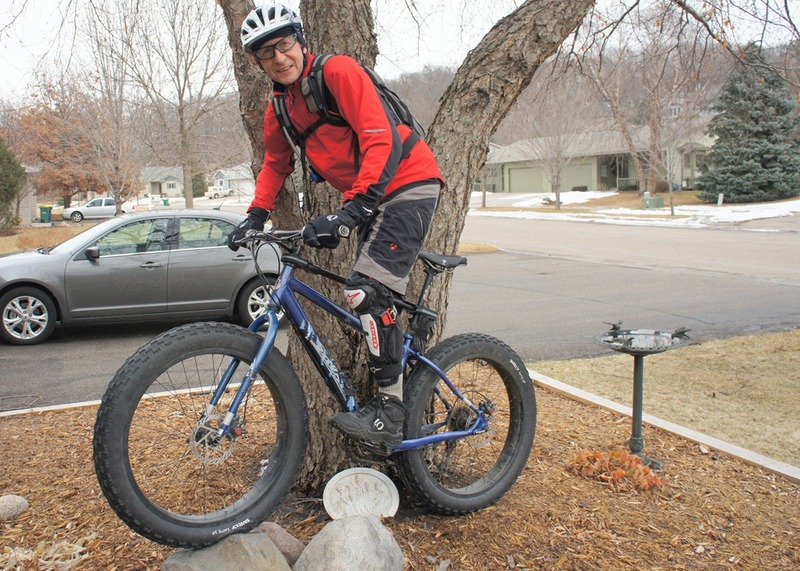 (I’m on a borrowed fat bike, as I’m on my way to the Cuyuna Lakes Whiteout up in Crosby-Ironton for my first-ever race this weekend.) I’ll only be coordinating the CVVC mountain bike rides, primarily on singletrack. Others will be coordinating the mountain bike racing and the gravel rides. For more about the CVVC, see this March, 2011 article in the Northfield News: Cannon Valley Velo gears up for its inaugural season. Glad to hear you are the Mountain Bike Ride Coordinator. Maybe there will be a nice easy beginner ride for someone like me 😉 I suppose I should get a mountain bike though unless I can manage on my hybrid. Bill and Myrna, I’m going to have to get the both of you out on a flow trail ASAP to see who’s the most advanced beginner.